Just because you aren’t in the south doesn’t mean you can’t enjoy RVing to some great NASCAR events and races. 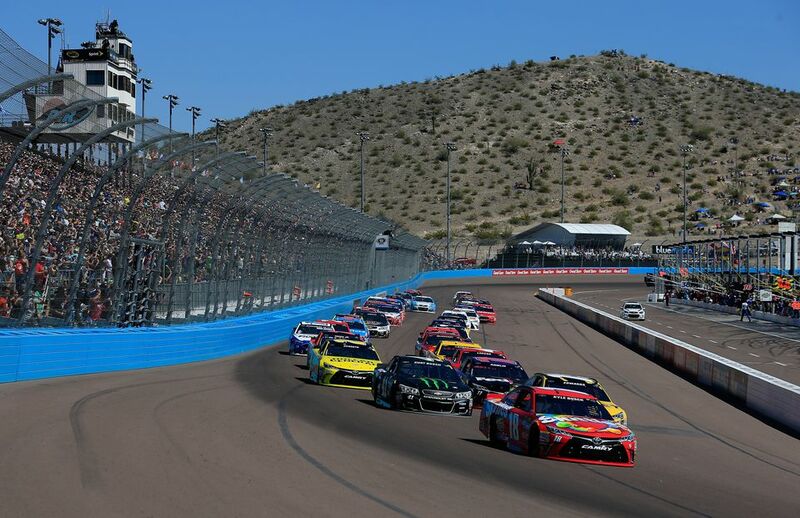 What was once a regional sport has gained in popularity to become a new national pastime and one track that’s a long way from the south but still hosts some real NASCAR action is found in ISM Raceway, formerly Phoenix International Raceway. Since RVing and NASCAR go together like sausage and gravy, many RVers flock to NASCAR tracks like ISM Raceway. To make the trip a bit easier for you we’ve done our homework on Phoenix to bring you information on the track, RVing to ISM Raceway, RV parks near ISM Raceway, as well as tips and tricks. If you want a great NASCAR event in the high desert, try heading to ISM Raceway. ISM Raceway opened its track in 1964, but it wasn’t until 1978 that NASCAR began holding sanctioned events at Phoenix and it wasn’t until 1988 that NASCAR hosted its first Sprint Cup Series event at ISM which caused the track to add 30,000 seats to the track immediately. In 1991 the 2.5-mile road course was demolished to make way for a more exciting 1.51-mile infield road course. Not long after that, the track was again remodeled in 2010 into a one-mile dogleg oval configuration while also changing much of the banking into progressive banking to make for more exciting races. Like most NASCAR tracks, there are a variety of different ways to RV to ISM Raceway. The two main types of sites are reserved and unreserved which as the name implies you can get into with or without a reservation depending on the spot. There are options for both infield RV camping as well as camping in the nearby parking areas. There are numerous amenities in many of the Phoenix RV parks, nicknamed Zoomtown USA, including showers, bathrooms, Safeway convenience store and more. There is also a tram that shuttles around different RV lots to get you to different parts of the track. For more information and details on RV parking and camping at Phoenix, please visit ISM Raceway’s camping and RV page. For those who don’t like to be in the thick of things but still near the action, there are some great nearby RV parks with more amenities. Here is a great nearby RV park. Less than ten miles for the track you can find Destiny Phoenix RV Resort. You have different choices when it comes to site types, but you can get a great site outfitted with full utility hookups, no problem. At Destiny Phoenix, you also get clean and bright bathrooms, showers and laundry facilities as well as plenty of other great amenities and features such as a clubhouse, fitness center, rec room, swimming pools, and dog run. A fantastic RV park near all of the action of ISM Raceway but with plenty of extra amenities. It’ll take you about 25 minutes to drive to ISM Raceway from here during race weekend. Cotton Lane RV Resort is a 55+ RVing community and resort, featuring full-time RV parking and traveler parking. Daily rates start at $34 throughout the year with rates spiking during NASCAR race weekends. These rates include water, sewer, and electric, so you'll be able to enjoy all the amenities on the road. With easy freeway access, a par three golf course, wireless internet, and an activity hall, there's plenty to do between races when visiting. It’s about a 20-minute drive from this RV park to ISM Raceway. RVs stage for spots at unreserved areas, make sure you get there plenty early to secure a spot for yourself. Read the rules and regulations for ISM before arriving at the venue to ensure both you and your RV neighbors have the best and safest time. Make sure you’re dry camping ready. Always stay hydrated in the Arizona heat. Plan your route and exit route out beforehand to help avoid gridlock. Different RV lots have different atmospheres. Try to find one that matches your RV lifestyle. If you want a reserved lot, you should go ahead and look into purchasing a spot for the following year. RVers tend to flock towards areas like Arizona during the winter, and it just happens that two major race weekends are around late and early winter. If you’re looking for a great get-your-motor-running good time and you love the high desert, you should consider RVing to ISM Raceway.